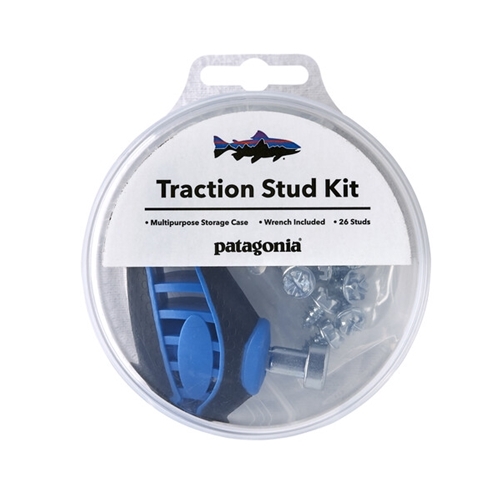 Patagonia Stud Kit by Danner is highly effective and versatile. 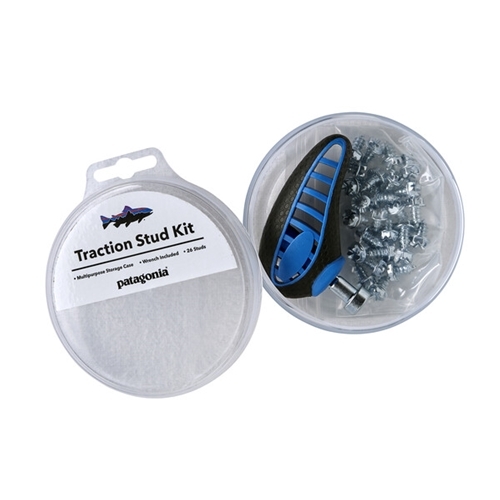 The Patagonia Stud Kit comes with 26 10mm steel traction studs with lock teeth. Comes with 1 wrench. These durable steel studs are designed specifically for our Foot Tractor – Sticky Rubber Wading Boots and River Salt Wading Boots. Each stud has a 6-head bite tip with locking teeth on the underside to ensure it stays securely fastened to the boot in challenging wading conditions. Sticky rubber and felt soles work because they’re soft enough to conform to the texture of subsurface rock. But sometimes you need a little extra bite to cut through algae, silt or other forms of aquatic slime. Turn rubber-soled wading boots into slime-cutting rock grabbers with these hardened, heat-treated steel studs. Easily installed or removed with an included wrench. The studs come in a handy, reusable storage container for convenient stowing in your vest or boat bag.